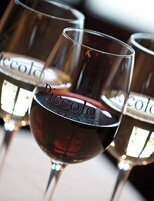 The 2018 Zagat Survey rates Piccolo 4.5 for food and 4.4 for service. Dishes expertly prepared by our kitchen staff include the famous Stuffed Artichoke, Fried Blue Point Oysters topped with Parma Prosciutto and finished with a truffle aioli, Crispy Long Island Duck, Prime Steaks, and an assortment of homemade pastas. On the lighter side there are plenty of organic salads and the freshest fish available at the market. Our extensive wine list recieved the Wine Spectator “Award of Excellence” for 2018. Open 7 nights a week for dinner from 5pm ’till close and 4pm on Sunday. Catering on or off premise is our pleasure. Please call and ask to discuss your party options. Also, our entire menu and specials are available for take-out order. How about a gift card in any denomination to say thanks or for that special occasion? Gift cards are available in person, by phone or online. Come visit us so we can spoil you with great food and unparalleled service. or call us at (631) 424-5592.